१५ मैथिली विकिपिडिया मिसन १० मे स्वागत अछि ! ४९ 27 Communities have joined WAM 2018, we're waiting for you! Thanks again for organizing Wikipedia Asian Month. There are only 7 days before it starts. Here are some notices and guidelines for organizing. Our Sample page with the new logo is ready to be translated. There are only a few adjust if you had this page for 2015 already. Article criteria is 3k bytes and 300 words. NO 2k bytes for smaller Wikipedia. According to the tool's limit, IP users can not participate. Please encourage them register an account. You may want to invite some of your Wikipedia friends or active Wikipedians from your home WIKI to help you organize. You may want to send some invitation to last year participants, active Wikipedians, and Wikipedians who has a special interest. Central Notice will be used but the effect could be limited due to the active Wikimedia Fundraising Campaign. You may use the Site Notice if you don't see the CN is deployed. We will keep sending postcards (new design) this year, and as an organizer you will receive an additional postcard as well. Please feel free to contact me on my meta talk page, send me an email by Email this User or chat with me on facebook. 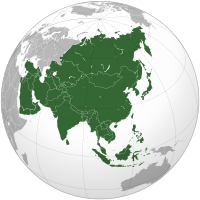 Only four days left before we enter November, the Wikipedia Asian Month! We are going to set up the Central Notice, which will help you achieve more sucess in upcoming WAM event and attract more people join your home Wikipedia. Step 2, translate the banner at here, make sure tranlsate the link to the event page of your home wiki. Step 3, when you finish the two steps, update this page. When both "Main Page" and "CN"(tranlsation) marked as done, I will enbale the CN in your language all the way to the end of November. You can find me on facebook by searching Addis Wang, and feel free to add me as well as chat with me for any question. Feel free to contact me with other language, I will try to understand it by google translate. A number of us are working on this system called Internet in a Box. Wondering if you can translate these three sentences into Mai? धन्यवाद ! सत्यजित राय, टम क्रुज, कङ्गना राणावत अनुप्रेषित कएल जा सकैत छल मुदा, सब शीघ्र मेटाएल जाइवला पृष्ठसभमे सामेल कएल गेल छल, तही लेल मेटाएल गेल अछि । आगा सँ हम धयान राखब आर कृपया अनुप्रेषित कएल जाए लेख सभमे यथा शिघ्र टयाग हटावल जाए वोकरवादे सुधार करवाक लेल हमरो आसानी होएत । लेख मेटाएल सम्बन्धमे ध्यानाकर्षण करेवाक लेल पुन: धन्यवाद !